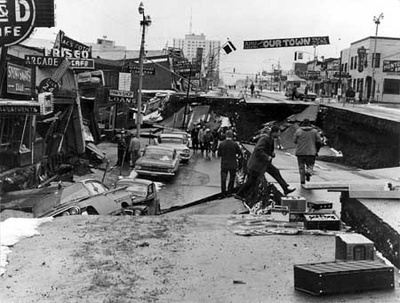 At 5:35 on a Friday night in Anchorage we had a stupendous earthquake at 9.2 on the Richter scale - it was adjusted later to that number because they didn't realize the spikes crossed. It was Good Friday. Outside in front of the house through the large picture window we watched our parked '57 Buick, in gear with the brake on, with each wave of the quake the car would come up on the front yard incline and nearly touch the house as it rolled back and forth. Buicks were very heavy so I had some idea of how intense the quake was - and amazing. In the backyard the trees rolled to the ground back and forth like a wave, like the ground was made of water. The snow was bright white, and then the ground appeared black as it rolled so it was quite a show. My kids were watching an episode of "Mighty Mouse" when the TV went off and they said, "who turned off the TV?" but they quickly realized we were going to have some fun with an earthquake. And they stood up to watch it, and watched in the back yard too --you could barely stand up. The primary earthquake lasted five minutes or so, and the only damage in our house was of a 1950 Motorola clock (a wedding present, one of a matching pair) and black malachite totemic statue fell and dented a stereo. 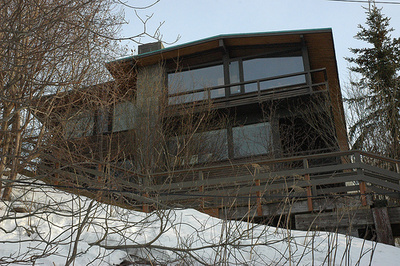 Our house in Mountain View was stable, on the gravel of an ancient river bed. Our neighbor Guntrin the baby sitter was at our house at the time of the quake and she kept ruining the earthquake for us, she would cry, "Oh God I'll be good, please God, I'll be good". And her two little kids were with her and she was scaring the bejesus out of them. She had endured bombing in Germany but we wondered what she did that was so bad to ask God for mercy like that. Our friends Joe (my boss) and Veneta Arns and their four kids showed up to make sure we were ok. They had driven in from south Anchorage. For the newborn baby next door, Rachel the youngest of the Jensen children, the Jensens were getting snow out of the yard to make water for the baby, it as easier to melt next to our fireplace. And I left Veneta in charge and she took care of all the 7 kids from the combined families, and as it turned out others too. Joe and I reported to work at the Alaska State Highway Department. And, we got our matching orders but I don't remember much that happened, it was just not enough. So more and more people starting coming to my house - I just done my shopping and stocked up on food and supplies as if I expected it. I had at least two or more cords of wood for our bright orange 1960's style hooded fireplace one of only two working fireplaces on our street. So we did not turn away anyone who wanted refuge, a warm house, clean water, and light, as I also had stocked emergency supplies such as hurricane lamps and kerosene. It became apparent quickly that I was needed to help with the rescue effort and founded what became known as "Damage Control". So because I could not watch the kids and the house was filling with people I decided to send my three children Outside to live with my sister Marilyn, and her second husband, her two children and my father in Malibu, California. Eventually there were approximately 150 people coming and going from my small 3 bedroom house with one bathroom. There were lots of buildings that were flattened from the shaking. New construction met the same fate. After the kids left I wrote an announcement for the radio requesting all architects, engineers, land appraisers, surveyors, typists with manual typewriters, to come and meet at Z J Loussac library at 10 am the following morning, a Monday I think. Fortunately the Loussac librarian heard the announcement over the radio and she was prepared to greet us so in this way we didn't break in to the library as I had planned. Lots of people came. We set up many teams of two people each with maps, we divided the city to try and figure out if there were people trapped and ascertain the damage and document it. The other purpose of the group was to prepare people for a possible tidal wave, a Tsunami as we called it. We went down to the water's edge and told people not to go to the beach it was dangerous and they were very likely to get wet [funny] - inundated by the Tsunami but no Tsunami ever showed up. I volunteered my car because I wasn't worried about the gas shortage, everyone else seemed to worry about that, but I didn't - I had a full tank. So the teams also used my car to get around and warn people. I broke into the Department of Natural Resources and took maps that we needed to identify block by block the places that were damaged. And I set up a system of percentages of damages which ranged from 100% which was a flattened useless building to minimal damage like 20%. My ex-husband, Roland Lane, a noted architect, was once of the few that did not come to the meeting. Later I found him sleeping in his apartment on 4th and L street which was very close to the fault line but he said "this building is never going to fall down, so go way and let me sleep". Pretty funny. He was right it never did, and neither did his "Cliff house" which was a few blocks away, on a cliff, overlooking the fault line. We chose the innocuous name Damage Control to deflect any criticism from people who may have lost friends or relatives in the earthquake in those buildings, we rendered what aide we could and documented all the known damage, building by building, block by block, and where that wasn't possible, we estimated in general at the town level such as Seward, which burned and lost the large oil and gas storage tanks. The regular officials entrusted with the authority to act were slow to respond. We sent a team of people out to check up on an emergency official who did not report to work after several days, they found him with his entire family sitting wrapped in blankets shivering in the cold claiming the world had come to an end. They were fed and comforted. But eventually we moved to the Civil Defense building where we set up a map of south-central Alaska on the wall with a piece of clear acetate over it. And as the runners bringing reports from distant regions poured in I took notes of the reported damage, fires, Tsunami damage, loss of life, boats destroyed or missing and the state of passibility of the roads and landing fields. Because communications were down people were using short wave radios, and signaling from the end of their drivable range to the next truck on the edge of it's drivable range, to bring in this news. In the midst of this clever form of tracking, with the situation news being hand delivered scrawled on little bits of paper or from memory a man entered the room, and pitched an offer, he had a truck full of gas, a cat (caterpillar) and front end moose gooser (plow), and he was offering to rent them each for $50 an hour. At this interruption, almost without stopping four of the men present picked the man up and thru him bodily out the door and down the stairs out of the building and returned to what we were working on. Quickly I realized that just capturing this news was not enough we needed to document it in such a way as we could send our representative to the US government in Washington DC and request emergency funds. When I completed compiling the damage report I had a man whose house had collapsed and he was the last one to leave Anchorage on the scheduled plane -- I got them to delay the flight to Washington DC. He flew to Washington met with President Johnson to request emergency funds. He returned with a promise of funding. He was the speaker of the house of the Alaska Legislature. I worked at the State while the kids stayed in Malibu. The reason I didn't say anything I just decided to do it - silently as benefit to everyone - and not a personal benefit. I stayed awake the first few weeks in 72 hour sections, and slept like 3-4 hours. I went too far, overextended myself and my health was never the same again after that summer. A week later we had another really bad earthquake almost as bad as the previous week. I was out at Elemendorf in the vault which was downstairs and it scared me because I didn't know we could have another really bad quake that close together. I was looking for photographs to send with Governor Egan to the President. We found tons of photos, a bunch of Seward, the train all scattered around twisted sections of the traintrack - they were relatively new. They included photos before and after the earthquake - they were terrible photos because they showed such detailed damage. We did not include any of dead people. Anyway it was scary. So Governor Egan took the photos I found with him to show President Johnson the amazing extent of the damages due to the Good Friday Quake, the fires, tsunami, and after quakes. Alaska was a new State at that time. In this way Alaska was able to get emergency funding really fast, and at that time our infrastructure always barely stringing along but it was able to get patched back together. More money came as we showed need; we were pretty desperate, and when the oil was discovered later in the 1960's it was widely seen as a god send that we had that help from the US federal government so quickly, and before a new source of revenue for the state and local peoples opened up. 1959 Alaska Statehood, President Eisenhower signs statehood bill on January 3. 1968 Oil pumped from a well at Prudhoe Bay on North Slope. Governor Hickel establishes Alaska Lands Claims Task Force that recommends a 40 million acre land settlement for Alaska Natives. 1969 North Slope Oil lease sale brings $900 million. First live satellite telecast in Alaska. 1971 Alaska Native Claims Settlement Act signed into law. 1973 Congress passes the Trans-Alaska Pipeline Authorization Act; salmon fisheries limited entry program becomes law. 1975 Alaska Legislature appropriates funds to initiate purchase and installation of 100 satellite earth stations for establishment of statewide satellite communications network. Thanks! That was very interesting to read. Have you been involved in any other natural disasters? See these images of one neighborhood after the quake. Thanks. Reading of this experience from someone that was actually there, tops any history or second story of this great catastrophe. Dee Lane died on Dec 6, 2017 in Anchorage, Alaska.